ISI has released another gem of a book. Its flagship publication The Intercollegiate Review has been appearing for 40 years and more, and now finally has a compilation of its rich content equal its stature. Hardly a Conservative luminary has failed to appear in this journal, and in this volume the editor gives us an excellent sample, evidencing the breadth and depth of subjects assayed. Highly recommended. 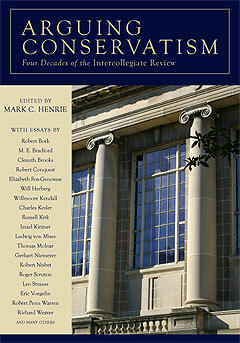 "With a circulation in the tens of thousands, and featuring foundational essays ranging across the disciplines — from political theory, philosophy, and economics to strategic studies, cultural criticism, and belles lettres — the Intercollegiate Review has been since 1965 one of the central organs of American conservative intellectual life. Many of the most serious thinkers on the right have appeared in the IR, and some of the most important theoretical debates in American conservatism have played out in its pages. At once sophisticated, penetrating, profound, and humane, the IR has consistently reflected the American conservative mind at its most thoughtful. From the Cold War and the Woodstock generation to the war on terror and the revolution in biotechnology, this collection of the IR's best essays from its first four decades constitutes a chronicle of contemporary American history as seen from the right. Arguing Conservatism includes essays by dozens of eminent thinkers, including Robert Bork, Cleanth Brooks, Robert Conquest, Ludwig von Mises, Robert Nisbet, Roger Scruton, Leo Strauss, Eric Voegelin, and Robert Penn Warren." Looks like this book is doomed for the discount bins. The cover lacks a close-up on a swooping Apache helicopter or a discharging artillery battery. Missing are war icons of any kind. There's no Hannity, Limbaugh, or even Coulter in a come hither pose. Worse, there's no Kagan, Kristol, Hansen and Podhoretz offering rousing exhortations to battle! Not to sound too militaristic, but ISI is the bomb. They get more of my hard-earned $$$ than any other publisher. Their reader's club is well worth joining. Individuality and Moral Reform: The Rhetoric of Liberty and the Reality of Restraint in Mill's "On Liberty"